Regina, Saskatchewan native Def3 has seen his fair share of success so far in his career, including the release of 2014’s award-winning LP, WILDLIF3. But with his latest endeavor, Small World, the stakes seem higher, and Def3 is poised to reach a higher level of success. The album bursts out of the gates with opener “Fill Your Soul,” a horns-filled testament to your passion regardless of how difficult things may seem. He reveals on the track that despite taking time off, losing some friends, and plenty of sleepless nights, the rapper continued to push his craft forward, making the art he loves. His adoration for Hip-Hop is palpable throughout Small World, and it’s only part of what makes it so instantly endearing. The other parts include a few familiar faces to the Hip-Hop heads out there. Living legends such as Del The Funky Homosapien, Masta Ace, and Moka Only all appear on the album in addition to underground stalwarts such as Dertmerchant (of Sweatshop Union), Probcause, and turntablist, Skratch Bastid. They all bring their inimitable skill sets to the album, and often on the same cut. Like on lead single “Sing,” which finds Def3 trading verses with Masta Ace and Probcause while Skratch shreds a Jay Z quotable to pieces. 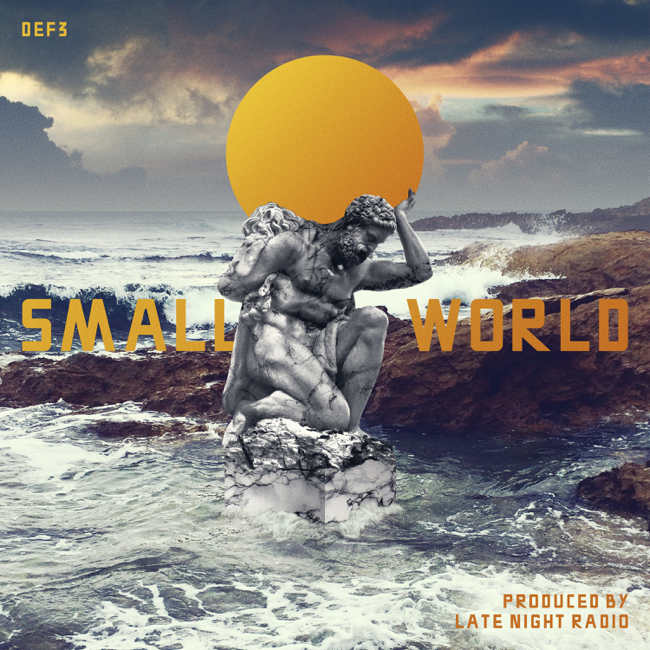 Small World packs its 11 tracks with sharp writing and a tight mission statement, all of which is fueled by soulful and funky production from Denver’s Late Night Radio. His approach to Boom bap fits Def3 like a glove, whether it’s providing a guitar-laden swagger on “S.O.S.” or capturing the emotional turmoil of “Carry On.” The two make for a great pairing, and hopefully this is just the first of many projects together. Small World is now available for both stream and download through the digital retailer of your choice, and is also available on CD, vinyl and cassette, via URBNET.